Please note if you are already a GTrek Bike Log owner that software updates are now available for download. You will first need to register your logger which you can do by clicking here or using the link below. 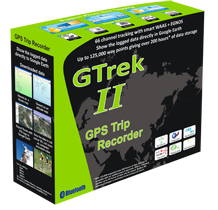 GTrek Bike is now available as an update to v2 software. Additions to the Ski Log information set include altitude and speed graphs by distance and calculation of hill inclination. If you are a registered user click on "Software Updates" link below and download this code now.